You’re supposed to get a day off from the computer and laze in bed with the comics. But today is July 9! Only 2 DAYS until publication day!!! Now, then! Although I can’t exactly offer comics, I do have something almost like a comic for you today! Here’s a sneak peek at the ELEPHANT Activity Kit! Like the LION Activity Kit, it will be up on my website any day now under For Teachers and Parents in the Coloring Pages & Activities section! Plus you will no doubt be thrilled to know that the ELEPHANT book trailer is possibly finished and will possibly be revealed in the not-too-distant future!!! And, if all that weren’t enough, if you’d like yet another shot at winning a signed copy of the book, you can hop on over to GoodReads and enter the giveaway! Enjoy your lazy morning in bed visiting the other tour stops (since you have your computer or stand-in for the comics anyway 🙂 ), coloring, and entering the giveaway! 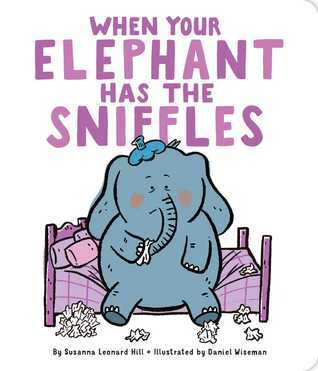 With all of the wonderful activities, I’m sure Elephant is feeling much better now. Enjoy this lovely summer Sunday! Who knows? He may play up the sniffles to get a little extra attention! 🙂 Thanks so much for taking time out of your Sunday, Patricia! Have a wonderful day!!! I can’t wait to read your books. Every post I see makes me hungry–good thing books and peanut butter don’t go well together. Congratulations on all of your books! I’m having so much fun following your blog tour! I love the elephant activity pages!! Love Elephant’s activity pages! My littles will love coloring them! AND reading your books, too. This is so much fun! Thanks for the blog tour. Thank you so much for coming along for the tour, Rene, and saying such nice things 🙂 I hope the actual activity kits will be up on my website in a day or two…! Stealing the comics from my grandparents newspaper (they got the ‘big city news’) is one of my favorite childhood memories! Thanks for continuing to share… I’m definitely sticking around for the rest of the celebration.